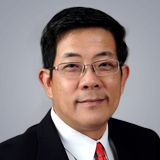 Alfred Choi, DDS, has been a practicing dentist since 1980. His areas of interests are cosmetic dentistry, crowns and bridges, extractions and minor oral surgeries, socket preservation and ridge augmentation, periodontal disease management, removable dentures, botox, and full-mouth reconstruction. He treats adults, teenagers and children starting at age 6. Dr. Choi went to dental school at the University of Singapore and graduated in 1980. He was a military dentist for two years before going into private practice. He moved to Florida in 1995 and has mostly been in private practice since. Dr. Choi also holds a Master of Business Administration (Finance) degree from Hull University in England, a Graduate Diploma in Business Administration from the Singapore Institute of Management, and a Master of Arts degree from Southeastern Baptist Seminary. He also keeps abreast of the latest developments in dentistry and is an active member of the Florida Academy of Cosmetic Dentistry and the American Academy of Facial Esthetics. Outside of work, Dr. Choi enjoys volunteering with his church, music, family, and gardening.